While on vacation in Oklahoma 3/25/17 - 4/2/17... my boyfriends and i acquired a new addition to our family... i saw an ad on craigslist and got in contact with a "breeder" in which we got our little guy from. We are not new to "small" nor "exotic" animals, although this was our first suggie. She stated he was 10 wks oop. Well, it never occurred to either of us to verify we were getting an "entire" glider i guess you could say. Because, as a reputable large dog breeder, for one, would not "sell" a deformed animal if one happened to be, let alone not inform someone that was interested in getting one. I guess the same cannot be said for everyone that gets into breeding. We met the woman at a public location, she had the little guy in a pouch, inside a box, which yes, she did open it so that I could see that he was in fact alive and in the box. Closed the box and went back to where we were staying. Go to let him into the cage to find out he is missing his front left arm and half of his tail!!!! To say we were a mixture of sad/mad/irate is putting it pretty mildly... I called her fuming questioning why she would not find that to be something worth mentioning, to which her reply was "well I gave you a $50 discount, figured that would be good enough"... I obviously wasn't about to let him go back to her... Well through joining a few groups on facebook and posting "Rex" story (reminds me of a little T-Rex with his short stubby arm) that he was WELL over the 10wk oop just from the size of the scent gland on the top of his head, that he was likely 8-10mos old at that time. Well now that you know his background, he is a total jerk lol. If we go anywhere near the cage, he will pee at us, usually on us... changing his food or water, he will jet from across the cage to literally attack, he bites really hard btw... We took out his sleeping pouch and put in the zip up-able bonding pouch til he goes in that so we can close it and bring him out of the cage (yes, when we are done with bonding time, he is put back in the cage with the regular sleeping pouch) he bites through the pouch. Needless to say, there's really not a second of any given time that you are in close proximity that if he is able to bite you will. We've changed his diet as advised to the BML I believe the initials are... So long story short.. what else can we do to help him?? we did have to postpone his neutering appt due to unforseen circumstances.. On 5/6/17 we did adopt 2 females (one is 2yr, the other is 4yr) and yes, they are in separate cages, on opposite sides of the room so there are no accidents whatsoever... There are no plans to actually introduce Rex to the girls until well after his appt... for about 15 min a day usually 9p-9:15p we put the cages about a foot apart and let them see each other though, which is pretty entertaining. If anyone has any suggestions, we are open to them. Hope my ridiculously long post wasn't too much of a bore. I need to give your post some thought, but in the meantime I am going to move it to bonding & Relations even though you have two issues to deal with which are the bonding as well as the physical impairments. something his parents did or some injury? Did the breeder give you any explanation? Her answer was "over-grooming" but I take that about as truthful as how old she said he was... he gets around amazingly well though.. hes quite "handi-capable"
Well through joining a few groups on facebook and posting "Rex" story (reminds me of a little T-Rex with his short stubby arm) that he was WELL over the 10wk oop just from the size of the scent gland on the top of his head, that he was likely 8-10mos old at that time. Well now that you know his background, he is a total jerk lol. If we go anywhere near the cage, he will pee at us, usually on us... changing his food or water, he will jet from across the cage to literally attack, he bites really hard btw... We took out his sleeping pouch and put in the zip up-able bonding pouch til he goes in that so we can close it and bring him out of the cage (yes, when we are done with bonding time, he is put back in the cage with the regular sleeping pouch) he bites through the pouch. Needless to say, there's really not a second of any given time that you are in close proximity that if he is able to bite you will. We always tell people to go at the pace set by the glider/s. Be patient. Don't push them, however, this little guy has to learn that you are not going to hurt him. It will be an uphill battle. Your first step is going to be giving him some time, probably lots of time spent just sitting and talking to him in a very soft voice. Let him get to know you that way. Try giving treats without using your fingers because you know what will happen if you try that You can use tweezers or a spoon. I need to look through our Archives to find you some links on dealing with gliders like this little one because I don't want to rely on my memory. I'm glad you have the little girls as well because they may eventually help you bring this fella around, but I would wait on introductions as you said. This looks like territorial behavior and not scared. As he is running across cage to do damage to you. Is there a weird crab with him charging. If so it is same behavior that would be done to a rival colony member that wandered into another colonies territory. You see similar in our squirrels that will be a serious chase around the yard. We had a female "Dot" with a simular issue. It took a lot of hard work and 6 months of working with her to calm her down. It took another 3 months to bond completely. But at 2.75 years old, she is a sweetheart. Daddy glider had a good question about the tone of his crab while charging. Is it a different sort of sound? Oh wow, first just let me say that I really wish I had my laptop! Unfortunately I have it in the shop. I'm so sorry, for both you and your glider! I am also so glad you had the heart to keep him and didn't return him. The fact that you are searching for help to get through this is very commendable and a good sign you have what it's going to take to do so. I could tell you a story about my Lulu, not quite the same as your Rex, as she is a girl, and doesn't spray the same, I believe. Please understand, though your Rex (I love the name also), my seam like a jerk, he isn't. He is frightened, very, severely frightened. I do not believe this to be territorial, well it kind of is if you factor in what's termed as "pouch protective". He sounds like in the same case of my Lulu to be "cage protective", so in a way it's partly territorial, but most is fear based. These situations happen largely due to anything from range of little or no human contact to sever neglect and possible abuse. He could have had injury due to another glider, posobly as mentioned or even a fight with cage mate or just getting stuck or injured on something he should not have had access to. 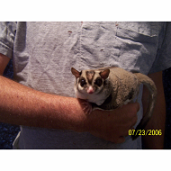 Over grooming is also often found in highly-stressed gliders or better phrased as easily-stressed gliders. This fits my Lulu as well. My Skadoosh was a more laid back glider. What works? Patience, consistency, love, and bribery. When I learned my Lulu was the way she was due to fear, it changed my whole outlook towards her and she became a mission. I first had to offer yogurt to my glider (due to Lulu, my Skadoosh was fine) by spoon. I used a plastic spoon and offered it through cage bars initially, so Lulu wouldn't attack my hand. Eventually, the spoon was offered inside the cage, but held safely far enough away from pouch opening. Lulu learned the spoon had treat, and I progressed slowly. This is a starting point. I have to go now, but will be back with more tips and suggestions. I'm sorry you've had such a rough first experience. Over groomed tails and ears on joeys can happen, but I've never seen an arm over groomed before. Gliders do adapt really well though, so as long as that wasn't caused by an injury not treated by a vet, he'll likely be fine. When you take him in for his neuter, the vet can check him over and let you know for sure. Now if the breeder lied and this was due to an injury, there could be some pain related to it and this could be some of the cause of his aggression. So the sooner the vet takes a look the better. Now if the aggression is not caused by pain and just lack of handling or previous trauma, then my advice would be to get a very small and compact pop up tent that you can sit inside and where he is pretty much within arms reach. I find these to be great for starting out bonding and earning trust and you will literally just take him in there in his cage pouch and let him explore and do his own thing. No touching, no grabbing .. just let him go at his pace and start by doing nothing other than sitting and talking. Wear socks, long pants and long sleeves to minimize areas to nip or bite and go at his pace. Take in a large square of fleece and when playtime is over use that to scoop him up and put him back in his pouch to go back to his cage if he doesn't go back in his pouch by himself. It may take a few weeks of just sitting with him and letting him see you're not threatening him in any way, but eventually he'll begin to relax more and you can take baby steps in working with him. edited to add: Getting him neutered and with the girls you may also see a drastic decrease in his aggression and/or fear responses. 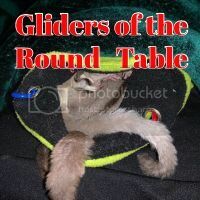 It can be amazing how something as simple as companionship can change the temperament of a fearful glider, to a calmer and more well rounded glider. Last edited by louissa; 05/11/17 10:21 PM. Wow... what an awful story! So glad you have little Rex now (looove his name). The more experienced folk on this board have some good tips. I used to call Fevy "Cujo" when I first got him because he was so evil. He ended up being a very nice suggie, but all gliders are different. Bribing him with honey and treats worked really well, and also carrying him around constantly. Do you have an old hoodie Rex might be convinced to sit in? That little fluffer is very lucky. Hope he gets along well with the girlies and I'd love to see pics of him eventually! You have been given a lot of good advice, I too believe getting him neutered and in with the girls may help dramatically. I have never had one charge at me, but I have had them stand up like a bear and swat at me. It takes time and a lot of patients. Keep us posted and ask any questions and we will try to answer. Whoa I didn't know that suggies could pee at you! What about poop, do they throw it like monkeys do?